There comes a point in every parent’s life where you look at your child’s developing smile and wonder, “Does my child need braces?” The next question that quickly follows is usually, “Will they look fine without them?” Financial concerns may come next. Many children will need braces at some point during their childhood. While cosmetic concerns might be present, the real reason that kids need braces is to correct misalignments of the teeth and jaw that could pose some real problems for their dental health down the line. As your kids’ mouths grow and develop, you might have noticed that some of their teeth are crooked, twisted, or even overlapping. Their teeth may be shifted in the wrong direction, or they may have a significant overbite, underbite, or cross bite. These issues can make caring for their teeth more difficult and even create additional problems in time. For instance, when a child’s teeth are packed in too tightly, it’s practically impossible for the toothbrush to reach the spaces in between, and sometimes these spaces can’t even be reached by dental floss. Unfortunately, plaque, tartar, and bacteria can still get in there, and that sets the stage for some serious decay. Additionally, if the spaces between the teeth can’t be flossed, periodontal disease is a likely result. When kids’ teeth are twisted or their bite doesn’t line up correctly, it creates tension and added pressure in places that aren’t designed to accommodate that pressure. Eventually, the result may be chipped or eroded teeth, jaw aches and pains, teeth grinding and clenching, and even disorders of the temporomandibular joint. As a parent, you want the best for your kids, and braces are an investment in your kids’ future dental health. When Should an Evaluation Be Done? The best time for an evaluation will depend on your child and the condition of their teeth and bite. Some kids need early orthodontic evaluation as young as six, but most can wait until most of their baby teeth have fallen out and been replaced by adult teeth, about age twelve or so. It’s important to bring your child in for regular checkups with Bountiful dentist Dr. Adrian. He’ll carefully monitor your child’s dental development, and if he spots a problem with tooth or bite alignment, he’ll point it out to you and let you know when the right time to visit an orthodontist is. If you have any specific concerns about the way your child’s mouth is developing, let Dr. Adrian know. It may be something that needs to be addressed, or it could be something that’s perfectly normal, in which case, he can reassure you and let you know what to watch for. 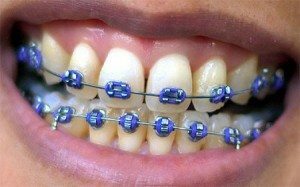 Should My Child See Dr. Adrian During Treatment With Braces? Absolutely. Your regular visits with your orthodontist will, of course, be important, but it’s also crucial to maintain good dental health during orthodontic treatment. Regular cleanings and examinations will help us make sure that your child’s teeth are in great shape, and we can provide tips and suggestions on how to keep them that way. Good brushing and flossing habits are vital while braces are on young teeth. It can be tricky to brush around the brackets and wires, but if you want your child’s teeth to look nice following treatment, it’s necessary. Special brushes and flossers are available to help you work around the brackets and wires, but a commitment to good oral hygiene habits is also required. If brushing is neglected, plaque and tartar can build up on the brackets and wires just like it can on your teeth. The area where the bracket connects to your teeth is especially vulnerable, and we’ve seen cases where the braces comes off and the enamel around the bracket was damaged because of a failure to brush, leaving marks on the teeth in the shape of the bracket. We want to help you avoid this, and good brushing habits and cleanings will prevent this situation from developing. Flossing is also necessary for good dental health. If flossing is neglected because the wires make it more challenging, your child could develop periodontal disease during braces treatment. Once gum disease develops, it’s challenging to reverse it. Is your child due for a cleaning and examination? Call us at (801) 292-7500 to schedule your appointment. While you are there, ask Dr. Adrian any questions you have about future orthodontics for your child. If Dr. Adrian thinks braces may be in your child’s future, he can provide you with a referral to an orthodontist.